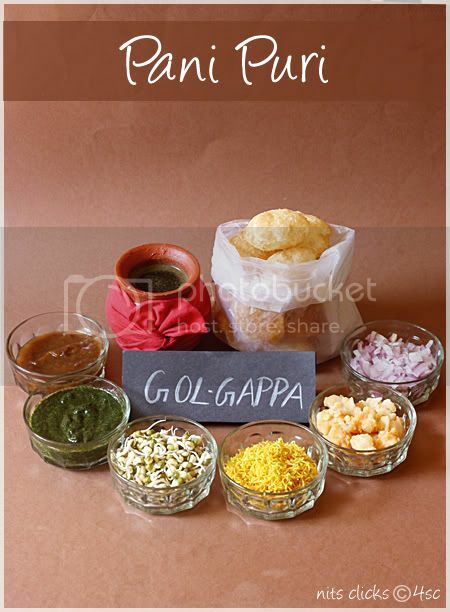 Pani puri is also called as Gol Gappa, Pani Ke Bataashe or Gup Chup. Its a very popular snack comprising of a hollow puri, fried crisp and filled with various mixtures and finally dipped in flavored water. I am going to give me quick version of pani puri here with store bought puri and Pani puri masala for the pani. Clean and wash the mint leaves. 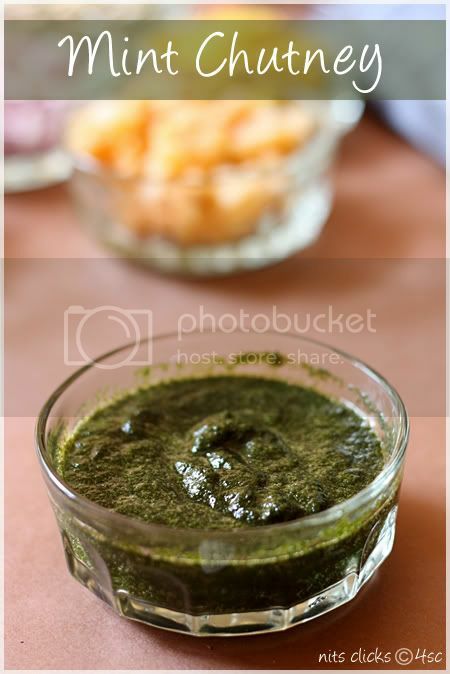 Grind mint leaves, green chillies, ginger and salt together to make the mint chutney. You can store this for upto ten days in the refrigerator and use them. Soak the dates in warm water for one hour. 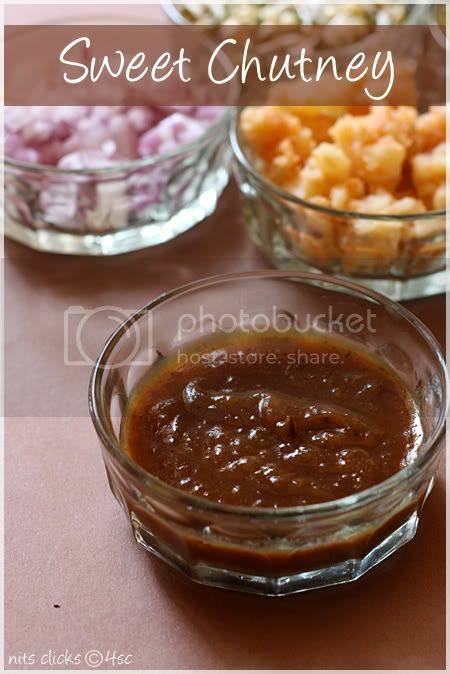 Grind the dates, tamarind paste and jaggery together in the mixie until smooth. Take a pan and add just a spoon of oil and crackle cumin seeds. Add the ground paste and a little water and cook this on medium flame for a while. Add a pinch of salt and asafoetida and mix well. Switch off once the chutney is slightly thick and sticky. I bought ready made pani puri powder by Everest brand and diluted 5 tblsp of powder for 2 cups of water to make pani. Cook the potatoes and smash them. Mix a tsp of chilly powder and required salt to the mashed potatoes. Chop onion finely and keep it aside. Check both the sides of the puri and choose the weakest side of the puri to break open a hole. This will help to keep the pani inside the puri till you gobble them. If you want to make these for a party, you can mix the mint chutney and sweet chutney to the pani itself and get all the puris filled with the rest of the ingredients and set it ready before you serve. Avoiding the wet ingredients(Mint and sweet chutney) in the puri will keep the puri crisp until it is served. Awesome clicks and really teasing me!! All pics are 100 % clicked to tempt who see it!! You are a devil nithi ;) haha,nice post,cute pics! Hi Nithya, I too am a big fan of chaat since I am a mumbaikar I make sure that whenever I am there I don't miss out on any items.Esp the vada pav which when eaten u feel like heaven.Ur pictures r lovely and tempting too. 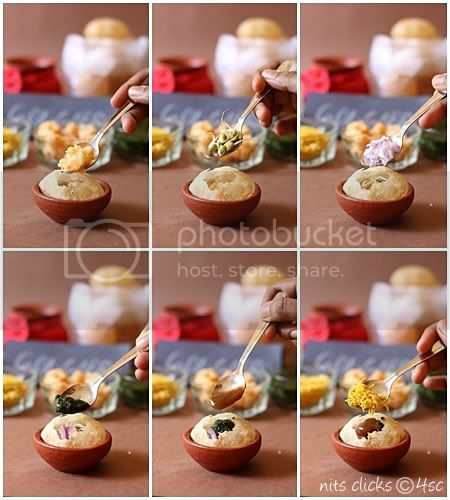 Trust you to come up with something like this--what a post..replete with the pani bowl covered with red cloth!I feel like eating pani puri now..shall I come over?Fantastic pics! Perfect chat dear,I love all the clicks...Your Presentations are always awesome. very lovely clicks...makes it very interesting!! pretty and tempting clicks..I am drooling over them !! OMG!!! Saying awesome is underestimating these too tempting, gorgeous clicks!!! Me not being a fan of chaats, is literally drooling at those cliks Nithya...Awesoem, fabulous, i am actually not getting a right word..Great job.. Cute post nithi... All the shots are so cute and mini chaat wala there. Even I too wanted to post chaat series but not really finding time. For now I am seriously tempted. Paani Poori looks so inviting. I wish I was there and could have a dozen of the gol gappas. Well written post dear and love the small pot. Oh my god awesome clicks. This looks tasty and yummy. I used to eat them in india near by my street. Cute paani poori.Looks delicious.So much flavoured. Who wont love this yummy combination... Awesome clicks..
Never tried making this at home your detailed recipe is giving me courage to venture into making this.Awesome pics as usual. 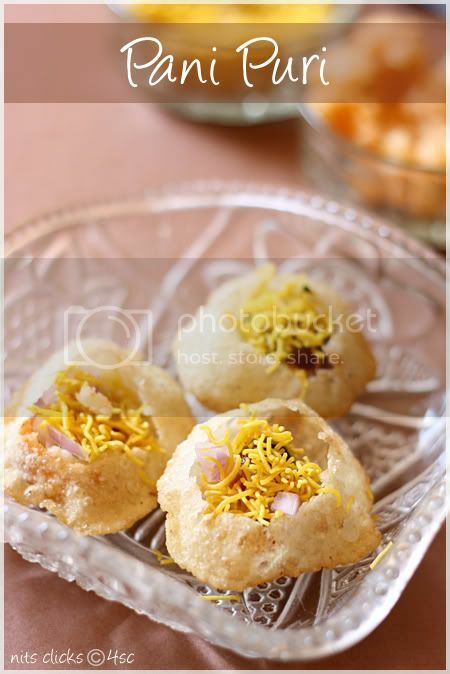 All time fav...your tempting me so much with your presentation and clicks..
Pani puri looks delicious, mouthwatering clicks! Very addictive chaat, just drooling rite now here...seriously i want to have some rite now..
Hey Nits,it's your responsibility now to send all of these :D Amazing pics . 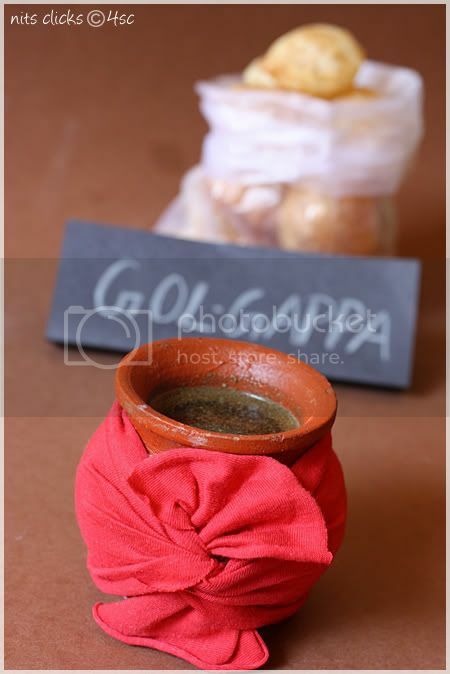 Luv the pani in earth ware to keep it cool,and ur tip on how to break the puri..Nice post on pani purris.. wow! 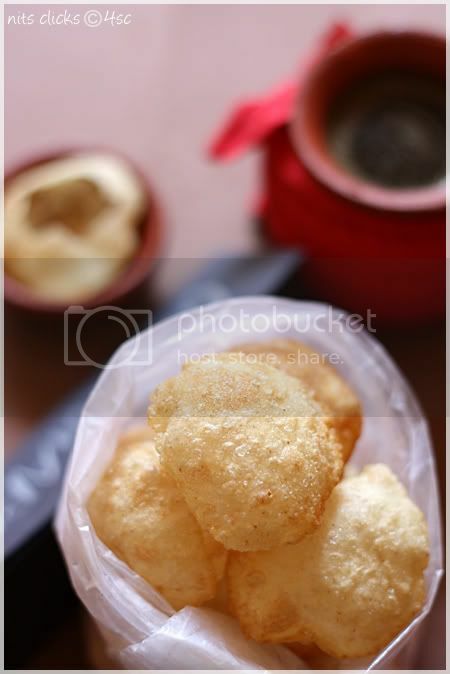 !superb click.....tempting and cute pani puri!!! Captured the soul of street food in your pictures. 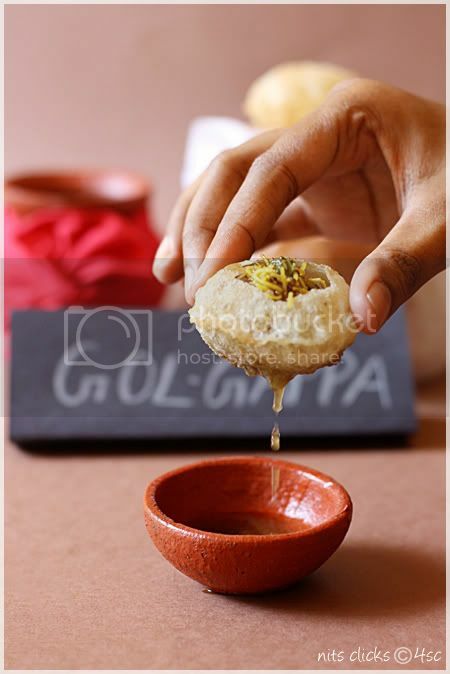 Oh..that minty water dropping from the gol gappa is just making me mad :) Lovely post, Nithi! Girl i'm sold out now, gosh i miss pani puri's it's fantastic! slurp slurp.. who doesn't like pani poori .. yummm! Beautiful pictures and post, Nithi! Loved it! Wonderful clicks, just drooling here...Nice post. Beautiful post and pictures Nithi!!! 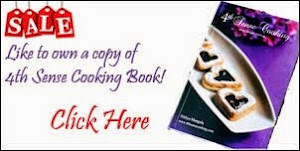 Pani Puri (or phuchka) is a great fast food item and I just love it... here's my version for preparing this at home. Learned the technique from my mom... Enjoy.